Our technical model is showing the completion of a downside capitulation signal for silver prices, indicating that a significant long term bottom is either already in place or will be finalized over the next several weeks across the silver market. Whether or not we see additional short-term weakness to the extent of a few dollars per ounce, the emergence from this pattern will represent a long term silver buy signal of similar magnitude to the one that occurred in November 2008, which saw silver rise over 400% within 2.5 years. Over the same timespan, certain silver miners saw gains well in excess of 1,000%. We remain optimistic on silver due to fundamental supply/demand metrics, which include significant uptrends in investor demand since 2005 amidst mostly inelastic and stable industrial and jewelry demand. Such will be the topic for another article; in this feature, we focus on the technical side of the market and begin with an examination of our most important indicator: the relative strength ratio of the company Silver Wheaton (SLW) to silver bullion. For anyone unfamiliar with Silver Wheaton, a quick summary of the company's business model will help explain the relevance of our signal. Silver Wheaton is the premier silver royalty streamer in the world: the company loans money to silver/gold miners needed for the development of primary mines. In exchange for these loans, Silver Wheaton receives a set number of ounces of silver as 'payment', to be delivered upon successful extraction from the ground, usually several years in the future. This means Silver Wheaton's profits are leveraged to the price of silver, due to the fixed nature of the company's input costs (loans to miners) and variable nature of their profits (the worldwide spot silver price). Silver Wheaton is in itself a fine vehicle for investment in silver, and it has attracted much attention in the silver world since its IPO in 2005 as a way to leverage an investment in the silver space. Because of this speculative attention, it tends to experience swings in sentiment that can be at times more exaggerated than the price of silver itself. In 10 years of available data, an examination of the SLW-to-silver ratio provides an illuminating look at these swings in market psychology. Generally, when silver prices are rising, investors become more bullish, and the ratio of SLW to silver increases as more investors look to leverage their bets through ownership of SLW. Conversely, when silver prices are falling, we often see the SLW to silver ratio fall as investor outlook for leveraging gains in silver deteriorates. Of course, this drop in sentiment has fundamental drivers, as Silver Wheaton could technically go bankrupt if the price of silver were to fall below its cash costs for an extended time (currently $4.15/oz. ), whereas silver bullion itself cannot ever be worth zero. Our chart contains three main sections: (1) the SLW / silver ratio, (2) the SLW price, and (3) the silver price, all plotted on the same time scale. As can be seen in the first section, the SLW / silver ratio has varied from 0.25 to 1.4 in its trading history, closing the week toward the middle of that range at 0.9. Over time, we would expect to see this ratio climb even with stable silver prices, as Silver Wheaton's business strategy is meant to be accretive to shareholders, and not merely a passive interest in bullion. The most significant aspect of this chart is the Relative Strength Indicator for the ratio, shown at the top. There is only one other time in 10 years of data (excluding the brief blip in May, 2011) when the RSI has ever fallen below 30 and stayed there for several weeks-- and that was during the crash of 2008, when silver fell to below $9/oz. and SLW fell to the $2.50 region. 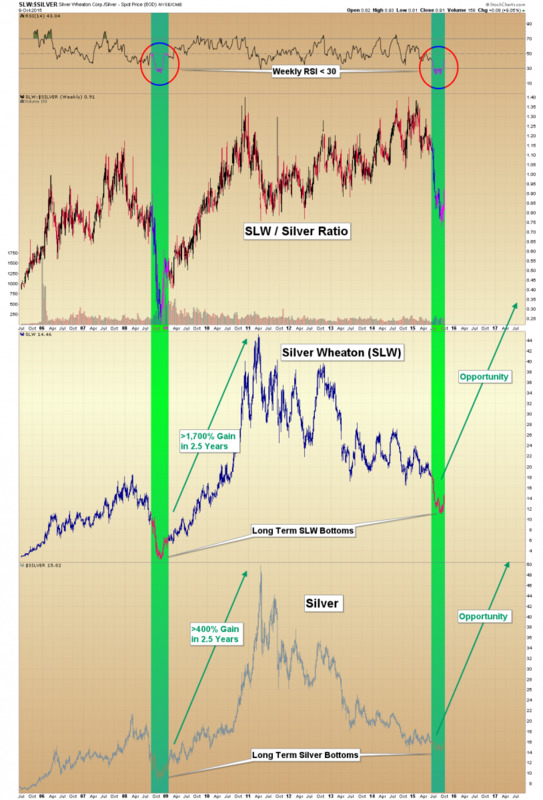 Note the monumental buying opportunity this 2008 low in the SLW / silver RSI signified. I will admit that on pure luck during the crash, I was a significant buyer of SLW below $3.00. It was during this time that I began to study the SLW / silver ratio and its ramifications for silver prices. Within 2.5 years of the lows, silver gained over 400% and SLW gained 1,700%, hitting $45 in the spring of 2011. This same depressed RSI on the SLW / silver ratio is again in the process of emerging from a significant bottom, the only other valid signal that we have on the chart. This means that silver investor sentiment as expressed in SLW, relative to the actual price of the commodity, is now as low as it was during the most severe crash in modern financial history. It is now as low as it was during a market panic. As contrarians, panic represents moments of opportunity for those with free capital and a time horizon of at least several years. These are the types of extremes in sentiment that we should look for to mark major turning points in market direction. A long-term view of silver confirms we are in an appropriate price zone for a major low, having recently fallen to the $14/oz. level several weeks ago before a slight rebound currently to $15.80. That $14 level matches nearly perfectly with our long-term linear uptrend line in place from 2003. 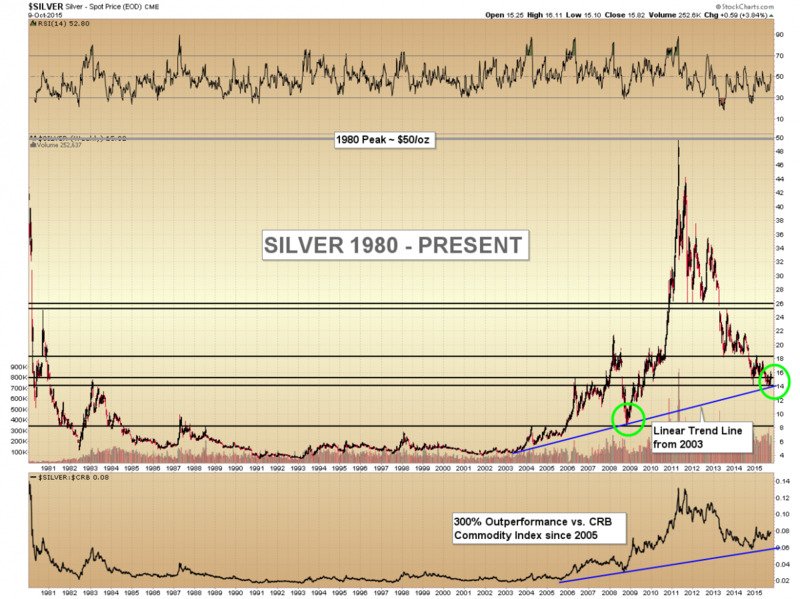 Of important note is that silver is one of the few commodities to still trade significantly below its 1980 peak. Gold, copper, and even oil all trade above their multi-decade consolidation highs that were hit several times from 1980 through the mid-2000's. Silver remains the bargain in the commodity space, despite outperformance against the CRB Index since 2005. We do expect that the next bull market in silver prices will see the $50 level exceeded and eventually become a floor, in the same way the $850/oz. has for gold, $35/barrel has for oil, and $1.20/lb. has for copper. A rare opportunity is setting up in the silver market for those investors with at least a several-year time horizon and a strong gut. Sentiment is as low as it was during the crash of 2008, despite solid fundamentals. We anticipate returns in the hundreds of percent over the next decade in silver bullion, interrupted with regular corrections in the 25-35% range. In that same timespan, we believe investors in Silver Wheaton or other highly-leveraged silver companies may again see gains above 1,000%. It does not take a huge allocation of one's portfolio to this thesis to have a tremendous wealth-enhancing effect.